The Hunter floorplan is spacious with 4 bedrooms, 2.5 bathrooms, and approximately 3,223 square feet of heated living space. 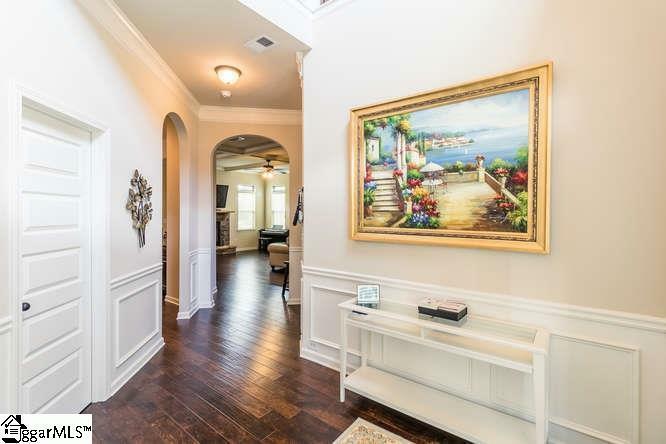 Stepping through the front door you are welcomed with a two-story entry down the hall into the charming living room/family room. 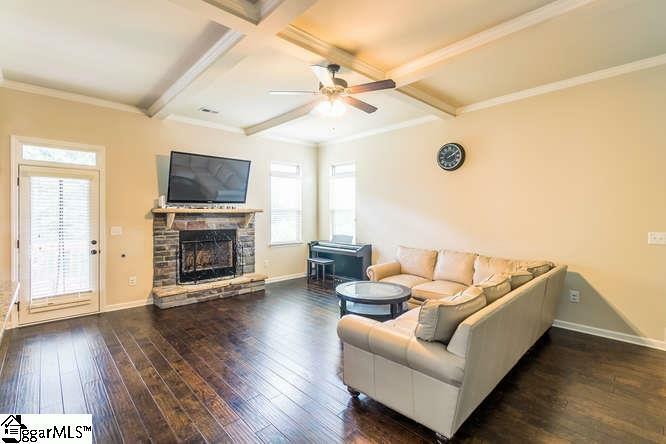 This room has a beautiful stone fireplace, rich hardwood floors and a coffered ceiling. Arched entryways pass through the kitchen area that has a chef-inspired design. The kitchen is equipped with stainless steel appliances that include a gas cook-top, double ovens, pot filler, tile backsplash and large pantry. The granite countertops and island are wonderful serving areas and plenty of room for prep work. The breakfast nook has lots of light and overlooks the back yard. 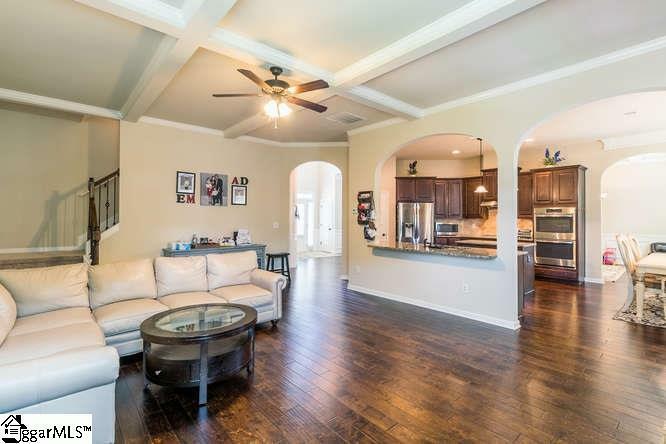 There is also a formal dining area that is a great option for the more classic dinners and a formal living room for entertaining. You will enjoy your large owner's suite on the 2nd floor with its volume ceiling and walk-in closet complete with custom shelving. The master bath affords ceramic tile flooring, dual vanities, a separate tiled shower and garden tub. Three additional bedrooms and the laundry room are located on the 2nd level and have large closets with custom shelving. 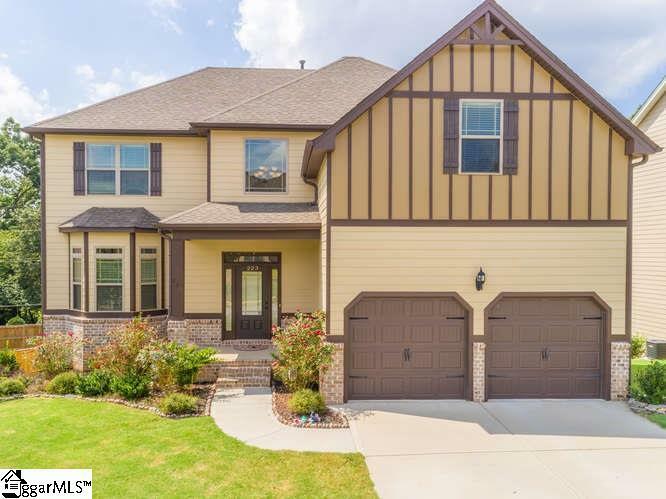 The covered porch and oversized deck are great additions to this home and what a perfect time of year to take advantage of the upcoming Fall nights. There is also a full unfinished basement with approximately 1427 square feet that is ready for you to design and complete. The neighborhood amenities feature a pool, cabana, and playground. All this is conveniently located within minutes to I -385, I-85, restaurants, shopping, and more! Listing provided courtesy of Susan Waters of Bhhs C Dan Joyner - Pelham.